Many of the paintings in “Amphibian,” EJ Hauser’s first solo exhibition at Regina Rex, feature an image of a frog. Or perhaps I should say, they look like an image of an image of an image of a frog. In previous work, Hauser took images and ran them through the gamut of digital degradation–printing, scanning, printing, scanning–until the original image is nearly unrecognizable. With these paintings, she works more directly, starting with a rich, multi-layered base of solid color and then painting the images on top. In most, the colors are not fully saturated, and the frog images are isolated in the center, but in twinned amphibian, Hauser paints two white figures against a bright, lively yellow, as if suddenly, her love object has found a friend. EJ Hauser, twinned amphibian, 2015, oil on canvas, 63 x 60 inches. When I visited her Sunset Park studio in 2014, Hauser had been mounting black-and-white prints of high-contrast digital images on panels and painting on top. In the new paintings she works directly on canvas without digital manipulation, but the line quality has the same digitized, auto-traced look of her previous work. What results are wonderful paintings with a clunky, Jean Dubuffet quality that just seems sardonically playful at first, but acquires more gravity in the context of Hauser’s disciplined transformational process and her choice of imagery, which combines mountains, statues, symbols, clocks, smiles, and gardens with the outlined frog form. 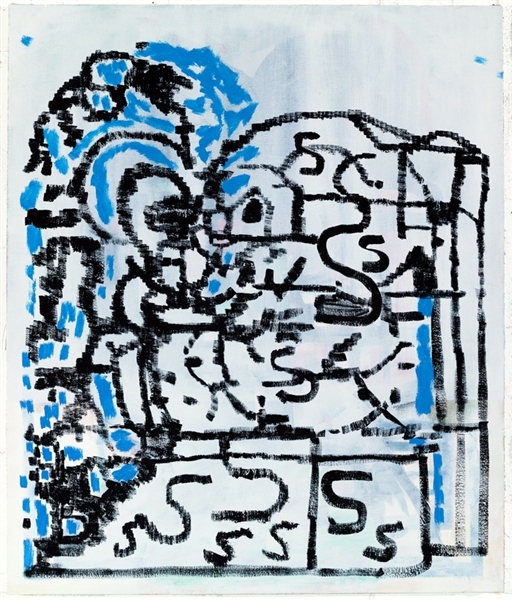 EJ Hauser, statue amphibian 7, 2015, oil on canvas, 63 x 60 inches. The paintings live in the region between painting and drawing, analog and digital. In the statement for the show, “the power of the amphibian to thrive across multiple physical and mythological realms” and “the morphology of forms” are cited as the ideas underpinning Hauser’s new work. Indeed, the humanoid amphibian is a staple in fiction, myth and folklore. The Bullywug in Dungeons and Dragons, Frog-Man in Marvel Comics, the Finfolk in Orkney folklore, the Loveland Frog, and the Brothers Grimm’s fairy-tale “Frog Prince,” are just a few examples. In Hauser’s compelling new paintings, the frogs, clocks, smiles, and mountains respectively might symbolize metamorphosis, time, ephemera, and permanence–phenomena that account for much of our worldly experience. EJ Hauser, ghost frog, 2015, oil on canvas, 40 x 30 inches. EJ Hauser, statue amphibian 2, 2015, oil on canvas, 20 x 16 inches. EJ Hauser, garden dwellers (summer), 2015, oil on canvas, 25 x 21 inches. EJ Hauser, garden dwellers (autumn), 2015, oil on canvas, 20 x 16 inches. EJ Hauser, purple smiler, 2015, oil on canvas, 33 x 29 inches. EJ Hauser @ Regina Rex, installation view. “EJ Hauser: Amphibian,” Regina Rex, LES, New York, NY. Through December 6, 2015. NOTE: Don’t miss Tamara Gonzales and Chris Martin’s facade and sign installation “…nudge the dice towards sevenness.” The title comes from a poem by Peter Lamborn Wilson.